Industrial policies in the EU have markedly shifted towards ‘horizontal’ measures and framework polices. The sustained de-industrialisation of several European economies and a general perception that countries with a strong manufacturing base emerged from the crisis in a strengthened position put the issue of industrial capacities back on the agenda. This process was paralleled by a renewed interest in specific industrial policies targeted at the manufacturing sector. 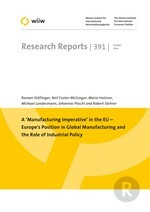 Against this background, this report revisits some of the main arguments in favour of a manufacturing imperative and discusses them in a European context also showing the limitations and caveats of these arguments. It proceeds by identifying the main challenges ahead of European manufacturing given the structural changes that occurred in the EU over the period 1995 to 2011. It also provides an analysis of a number of industrial policy measures that are important in a European context such as state aid by EU Member States, public R&D support for firms and the role of initial vocational training systems as a potential ‘soft’ industrial policy tool. Based on the results of the analysis, the report summarises the policy implications and offers recommendation to master the major structural challenges that lie ahead of European industry.